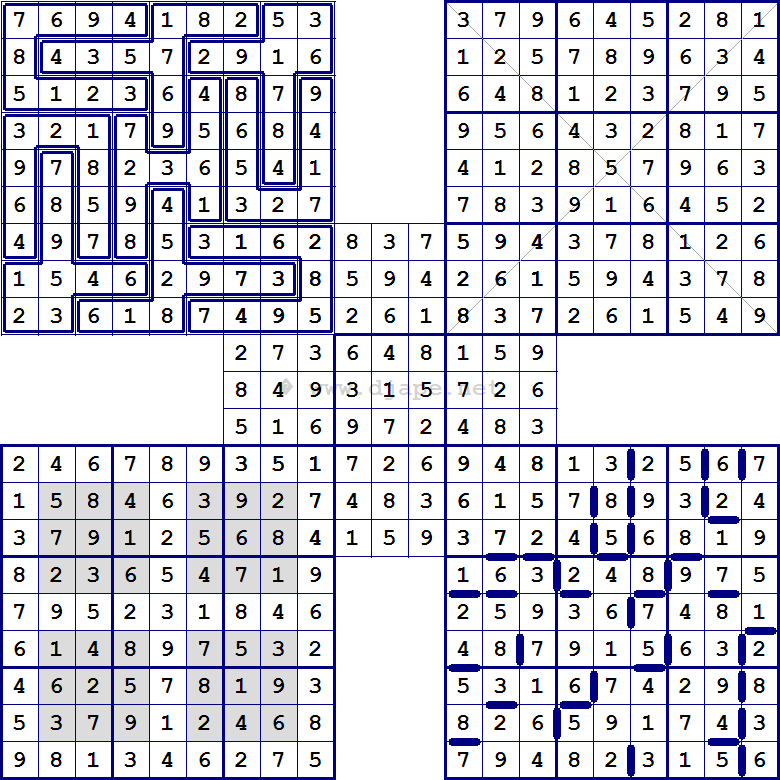 The central sub-puzzle is Non Consecutive Sudoku. This is crucial, because it looks like ordinary sudoku, but it is not! You cannot place two consecutive numbers inside the central sub-puzzle! Top left is Jigsaw Sudoku. Top Right is Diagonal Sudoku. Bottom Left is Hyper Sudoku Windoku. Bottom Right is Consecutive Sudoku. If there is a horizontal or a vertical bar between two cells, then the numbers inside them must be consecutive. If there is no such bar, the numbers must be non consecutive. Get it? 🙂 UPDATE: The solution has been updated. 🙂 The puzzle is rated IQ but it’s not all that hard… I think. 🙂 Hint: Don’t start with the Hyper or the Non-cons! PDF Version of this puzzle: Multi Sudoku Samurai Printable PDF difficult.. Oh, and don’t be confused… each sub-puzzle cannot be solved independently! If you try that, you will get multiple solutions! However, the whole puzzle does have a unique solution! So you must work on the puzzle as a whole. Read the Samurai Sudoku rules first! This entry was posted in Free sample puzzles, Jigsaw Sudoku, Samurai sudoku, Sudoku Variants and tagged samurai, variant. Bookmark the permalink. Post a comment or leave a trackback: Trackback URL. First and foremost – I love the puzzle! I am very addicted to your five and 13 grid layouts and have never really done the other variants – but now I will have to learn because I adore the puzzle you just sent! thank you so much! However, clicking on the button for the answer, just showed me the empty puzzle again. I did get the answers from the lower print out, though. You might want to change that. I can’t wait to try the new puzzle! Thank you again.